The Economic and Financial Crimes Commission (EFCC) has asked a Federal High Court Sitting in Lagos to grant an order of interim forfeiture of the sum of $3,645,013.73 (Three Million, Six Hundred and Forty Five Thousand, Thirteen United States Dollar, Seventy Three Cent) domiciled with First Bank of Nigeria Ltd and traced to Mrs Patience Jonathan, wife of the former President. The Economic and Financial Crimes Commission (EFCC) has asked a Federal High Court Sitting in Lagos to grant an exparte order of interim forfeiture of the sum of $3,645,013.73 (Three Million, Six Hundred and Forty Five Thousand, Thirteen United States Dollar, Seventy Three Cent) domiciled with First Bank of Nigeria Limited and traced to Mrs Patience Jonathan, wife of Nigeria’s former President. An investigating officer with the EFCC, Huleji Tukura in an affidavit placed before the court says that the account was opened while Mrs Jonathan served as the permanent secretary of the Bayelsa State Government. The EFCC says that she had then procured the then Senior Special Assistant to the Former President on Domestic Affairs and Household matters, Hon. Waripamo-Owei Dudafa to fund the account with proceeds of unlawful activities allegedly diverted from the Federal Government. Dudafa on the other hand was said to have procured one Festus Iyoha and Arivi Peter who are domestic staff attached to the State House Abuja to also deposit funds in to the account by using fictitious names. A total sum of $4,036,750.00 (Four Million, Thirty Six Thousand, Seven Hundred and Fifty United States dollar) reasonably suspected to be proceeds of unlawful activities were deposited into the account, out of which Mrs Jonathan had withdrawn the sum of $1,000,000.00 cash leaving the balance of the sum of $3,645,013.73 which sum we the EFCC now seeks its forfeiture to the Federal Government. 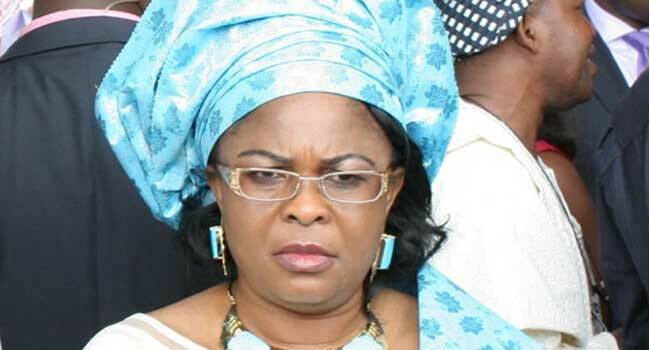 Asides this sum, the EFCC is also seeking the interim forfeiture of another $4.3m, N1.8bn, N226m, $429,381.87 cents and various other sums traced to 6 others said to have links with Mrs Jonathan. The six others are Globus Integrated Services limited, Finchley Top Homes Limited, Am-Pm Global Network Limited, Pagmat Oil And Gas Limited, Magel Resort Limited and one Esther Oba who is said to be at large. Justice Mojisola Olatoregun refused to listen to Mr Ifedayo Adedipe, SAN and Mr Mike Ozekhome SAN who led a group of other lawyers to defend all seven respondents. The court agreed with the EFCC that the application was exparte and as such, they had no right of audience. The lawyers staged a walk out of the court but before leaving, they made the point that the application was an abuse of court process as the EFCC had filed about 4 cases on the same subject matter before other judges of the court. In a short ruling on the application, Justice Olatoregun directed the EFCC to file within 7days an affidavit showing that the application before him is not the subject matter of litigation before any other court. He then adjourned further proceedings till the 23rd of January.